This item elevates your plants, and protects them from hot concrete or cold tile. 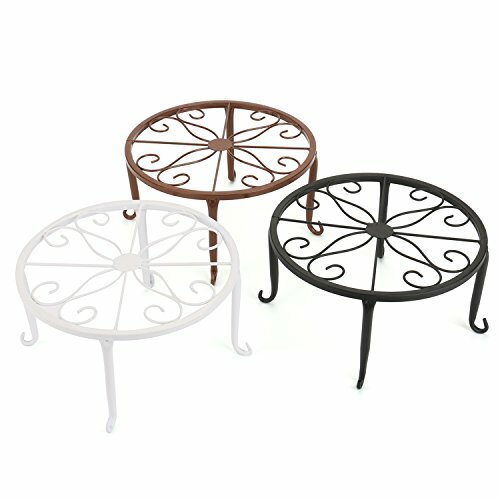 The scrollwork on the top of the four supportig legs adds a decorative touch, and creates a sturdy support for your potted plants. The item holds pots up to 9-inch in diameter and is supported by four slightly curved feet. The sturdy steel construction will last for several years, and the black color will enhance your plants. Keep your favorite flowers or herbs off of the ground with the olde world forged pot. Measures 9" diameter by 5" height. Pack of 3 in black, white and brown color. The scrollwork on the top of the plant stand adds a decorative touch, and creates a sturdy support for your potted plants. The sturdy steel construction will last for several years, and the color will enhance your plants. Pack of 3 in black, white and brown color. Measures 9" diameter by 5" height. If you have any questions about this product by Tosnail, contact us by completing and submitting the form below. If you are looking for a specif part number, please include it with your message.